Actor John Simm recently remarked that many of his roles have an “everyman” quality, where average citizens are thrust into unusual situations (ok excluding Doctor Who‘s Master, obviously). The latest is White Dragon, an 8 part drama written by newcomers Mark Denton and Jonny Stockwood. Known as Strangers in the UK, this production is entrenched in modern Hong Kong. 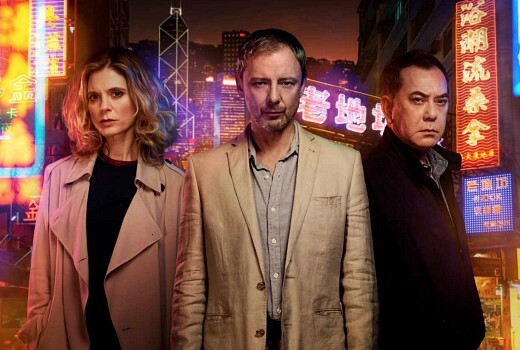 Simm plays British Professor Jonah Mulray who is hauled out of a lecture only to be told that his wife Megan has been killed in a car accident while working in Hong Kong. Numbed by the news, he takes his first flight to the Asian country full of regret that he never did so earlier. “I used to ask myself why does my wife like HK so much?” he realises. As the mystery deepens he leans upon British Consul Sally Porter (Emilia Fox) for assistance. Meanwhile there is an Australian journalist Michael Cohen (Anthony Hayes) digging into the incident, and a young woman Lau Chen (Katie Leung) protesting against a corporate businessman running for government. The new versus old tug of war, as personified by Lau Chen, is part of the reason this is set in Hong Kong. The colonial past as denoted by the title, is contrasted by the neon clash of Hong Kong’s electric skyline. It’s a bit of a shame the title has been altered for the UK, as if to distance itself from any moral responsibility or guilt attached to British reign in the territory. Simm is dependable as always, shifting from grieving husband to confused and angry man in the spate of a single episode. One can only hope that his narrative arc is infinitely more satisfying than his last UK drama, Trauma, which descended into stupidity after promising so much. Aussie Anthony Hayes in a supporting role looks set to mine the truth of his investigation and refusing to cower to emotional pressure. The Hong Kong locations, from Central to Chungking Mansions, are exotic and colourful if sometimes seemingly cleared of populous crowds. While it may not pack the punch of the best Asian thrillers, White Dragon works best thanks to Simm, which is reason enough to add to your watch list if you have room. White Dragon airs 8:30pm Wednesday on BBC First. I have had white dragon set to record for about a week, or when david first mentioned it. this is another itv programme in conjunction with amazon, itv owns world productions which produced bodyguard so has the worldwide distribution rights. i agree its a mess shows that once would have simply turned up on the abc are now scattered all over the place. I will watch…if and when it turns up on FTA…maybe in about 2 years and if I have not shuffled off this mortal coil by then… *G*. I was going to ask the question … which Wednesday since neither Strangers nor White Dragon is listed on the BBC First TV Guide web page … bbcaustralia.com/tv-guide/ … it has “The Musketeers” listed at 8:30pm on both the 12th & 19th. But looking at Foxtel and Fetch TV guides … yep it’s listed. BBC Australia can’t even get their own TV Guide right!!!! Also, I find it somewhat odd that BBC First ‘fast track’ Strangers/White Dragon, yet don’t do the same for the “Bodyguard” (and a bunch of other UK shows for that matter) which has been reported here & elsewhere as being the “biggest new UK drama in a decade”. BTW … the Bodyguard is very good. White Dragon is a late addition, announced last week. Agree their Guide should have updated by now. I’ve noted in the past too many of their shows are not fast-tracked (this one is) and will seek to raise it again soon. Bodyguard will not be coming to BBC First, I suspect Amazon. Having Bodyguard on Amazon will be a surprise for enthusiasts of UK drama especially a show which will be at the top of the list for those viewers hoping that BBC First would provide their usual delayed broadcast of Bodyguard as they did for another much anticipated show, Taboo. Those with patience will get to see Bodyguard eventually but only when all the fuss has died down, I suspect that Foxtel will not win many fans. Same as McMafia. It’s nothing to do with Foxtel, out of their hands.